Do you want to become a medical assistant – but don’t have the time or money to take traditional campus-based courses? Let us help you find an online medical assistant program. Our goal is to provide you with enough information to make an educated decision on which school to choose. Note to Colleges: if you don’t see your program listed and you offer an accredited medical assistant program, you can be added to our list, by reaching out to us using our contact page. How do we rank the schools? Must offer a diploma, certificate, associates, or bachelors degree in medical assisting. All classes required to graduate need to be available online. We do not list schools with partial-online programs. (Note: some schools listed below also offer on-site campus locations). Schools must be recognized by at least one Accreditation agency (more info on accreditation). Schools must offer or provide information on federal financial aid, scholarships, or tuition reimbursement. Schools must provide post graduate job placement assistance via in-house or third party services. Not sure an online program is right for you? 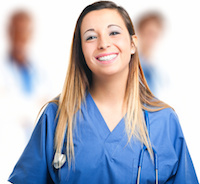 View programs by state to find campus-based medical assistant programs in your area. As a medical assistant you will enjoy a rewarding career working in a healthcare setting such as a hospital, outpatient clinic, physician’s office, or long-term care facility, among others. You will serve as a vital member of a healthcare team where you will be responsible for many of the clinical and administrative duties that help ensure day-to-day operations are efficient and well-coordinated. The demand for qualified medical assistants is growing. According to the U.S. Bureau of Labor Statistics, the number of jobs for medical assistants is expected to grow by 29% over the next decade. Entering the field of medical assisting starts with the right education. Medical assistant programs are specifically designed to provide the training you need to become an integral part of any healthcare team. Online medical assistant programs provide training through a variety of methods that include streaming lectures and video clips, interactive discussions, slide show presentations, and more. Because the content is offered entirely online, you would be able to complete your work from any location at any time. Even if you have a family and a full-time job, you can get the education you need to start a new career without neglecting your current responsibilities. When enrolled in an online program, you would complete clinical practice requirements through a healthcare facility in your area. This combination of online coursework and clinical experience provides everything you need to develop the competencies required to begin working immediately after graduation. The goal of online medical assisting programs is identical to that of programs found in traditional campus settings. These programs are designed to fully prepare you to perform clinical and administrative tasks under the supervision of registered nurses and physicians. Not all online medical assisting programs are the same. Programs accredited by either the Commission on Accreditation of Allied Health Education Programs (CAAHEP) or the Accrediting Bureau of Health Education Schools (ABHES) will include all the coursework and clinical experience necessary to become a certified medical assistant (CMA). You must graduate from one of these programs to be eligible to sit for the certification exam. You should also consider the type of program you want to enroll in. Certificate and diploma programs typically take 12-18 months to complete, while associate’s degree programs typically take between 18 and 24 months to complete. As with any profession, a higher level of training often means increased employment opportunities and the potential to earn a higher salary. While all programs teach the basics of medical assisting, associate’s degree programs include general education courses in addition to medical assistant training. This is the best choice if you plan to complete a bachelor’s degree program at a later time. Finally, you should look for programs that include certification preparation or review courses, as well as those that provide internship or externship opportunities. This is especially important if you intend to become certified, have plans to perform specialized functions, or plan to work solely as either an administrative or clinical medical assistant. Diploma Program – A diploma program can be completed in 2-3 semesters and, if properly accredited, may qualify you to take the CMA certification exam. Diploma programs often include training in administration, medical law, office management, anatomy and physiology, clinical procedures, medical terminology, and also include some exposure to clinical practice. Certificate Program – Certificate programs allow you to easily transfer to an associate’s degree program and can qualify you for the certified medical assistant exam. In these programs, you can expect to study basic concepts, perform record maintenance, assist physicians, and practice other clinical and administrative duties. In addition, you will explore the ethical and legal responsibilities associated with working in the healthcare industry. These programs also often include a number of options for gaining clinical experience. Associate’s Degree Program – Associate’s degree programs are much more in-depth and include general education courses like English, psychology, sociology, and mathematics, as well as medical assisting courses. These courses may include medical billing and coding, insurance billing, medical terminology, anatomy and physiology, accounting, laboratory procedures, and much more. These programs also typically include clinical experiences in both clinical and administrative settings. Whether at the diploma, certificate or associate’s level, online medical assistant programs provide everything you need to enter this exciting field. Online programs are the best option if you are interested in getting an education while working, taking care of a family, or meeting other responsibilities and obligations. Online programs provide all the training necessary to become a medical assistant, while allowing you to set a schedule that fits your busy life.